I have an concept Widget thas has children of abstract concept Property having an expression node from the base language. 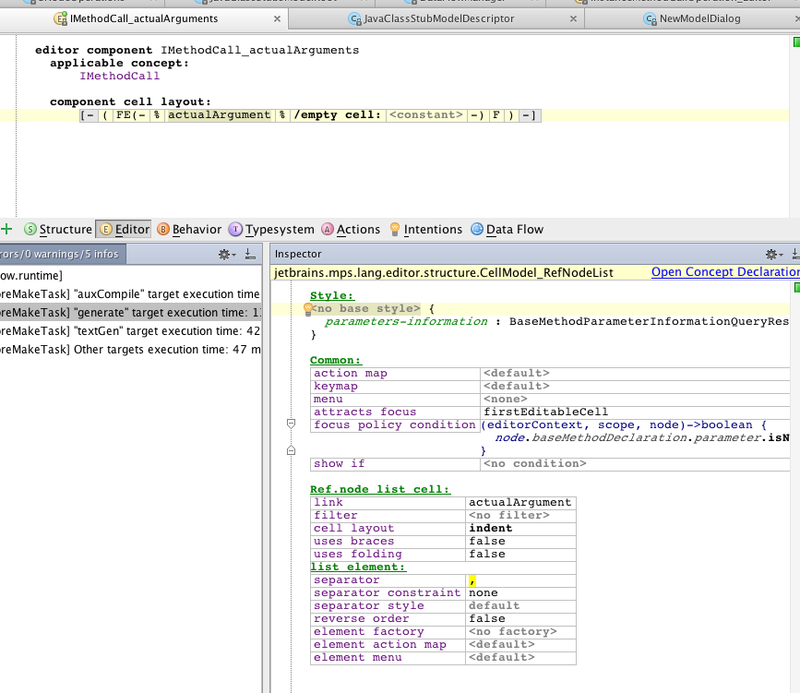 Each of concepts inheriting from Property has its own editor looking like x = <expression> in the model editor. Also a related question is how to specify which set of Property children are acceptable for the given subclass of the Widget concept. So that for example I can express in my language structure that concept W1 has X sub-concept of Property and concept W2 has X and Y sub-concepts of Property? You just add a %your_child_role% cell in editor and set the "separator" property for it in inspector. This will insert editors for child nodes, which will be separated by the separator symbol. You can look, for example, how it's done for method arguments (see attached screenshot).